Neptunes players and officials celebrate their title success. As could be anticipated and as was the case last year, when the Saints had already sealed the league title before the St Julian’s teams met in what was supposed to be the showdown duel, the match between the 2016 newly-crowned champions Neptunes Grimaldi and outgoing title-holders San Ġiljan Salini Resort did not go a long way in terms of motivation. At the very most, the team guided by Marko Orlovic were after a positive ending to the championship campaign while the Reds wanted to, at least, preserve their unbeaten record. Thankfully, these targets did not render the clash a complete dead rubber. However, the Reds’ motivation outweighed that of their opponents and yesterday’s 17-11 success testifies to their clearcut edge over the Saints as their 53 goals scored and 33 conceded during their three league victories and one draw against their neighbours clearly shows. This team guided by Zoran Maslovar soon realised that they were after something doable after taking the early initiative. They built a comfortable 6-1 buffer which had Jordan Camilleri netting four of five personal goals after which they played at a canter to preserve their notable advantage. In the last quarter their coach even put in most of their inexperienced tailenders at one go. Aside of a shortfall in motivation, San Ġiljan were also handicapped by the absence of Aurelien Cousin and Paul Fava. In the end Neptunes made it a royal finale after their outstanding 36-year old captain Niki Lanzon was presented with the champions trophy by BOV Chief Executive Paul Gauci in the presence of ASA vice-president (waterpolo) Karl Galea. The Reds’s colourful celebrations followed with the revelry starting from the Tal-Qroqq pool and continuing at their club till late in the evening. Theirs was a truly memorable league season. Exiles Jetfreight sealed their place in the premier division after beating First Division champions Marsaxlokk Fischer 14-5 in yesterday’s first match. 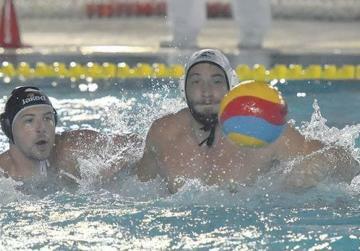 With Dorian Pisani’s team winning the first relegation decider and confronting a side shorn of six regular components, the match was one-sided at least during the opening sessions when the Sliema team had their best players in the water. The Exiles coach then opted for wholesale changes after the interval and thus the contest became closer although the scoreline kept widening for the winners for whom David Pace Lupi and Nicky Paris each scored four goals. Rainer Scerri, for Marsaxlokk, replied with a hat-trick. Marsaxlokk: A. Xuereb, L. Calleja, C. Gialanze 1, C. Bugeja, G. Busuttil, R. Scerri 3, K. Navarro 1, K. Debattista. Exiles: I. Bugeja, J. Rizzo Naudi, S. Vassallo, D. Pace Lupi 4, D. Borg Millo, M. Paris, S. Gravina, K. Griscti 3, N. Paris 4, A. Bianchi, L. Felice 1, M. Vukicevic 2, K. Lanzon. Referees: Alex De Raffaele, Andrea Baretta. San Ġiljan: J. Sammut, P. Borg, A. Galea, B. Vapenski 7, M. Zammit 1, K. Galea 1, C. Mercieca, B. Plumpton 1, Darren Zammit, L. Saliba, Dino Zammit 1, D. Camilleri. Neptunes: A. Borg Cole, N. Lanzon 3, C. Radu 2, M. Cutajar, T. Agius, M. Lanzon, S. Camilleri 4, J. Camilleri 5, J. Abela 1, M. Zammit 1, B. Lanzon 1, M. Azzopardi, M. Castillo. Referees: Peter Balzan, Filippo Gomez. With the summer competitions over attention will now be turned to the Maltese Under 19 team in the European Junior Waterpolo Championship in Alphen, Holland. The Maltese outfit will be in Group D with Hungary, Montenegro and Greece. The 13 players forming the squad are: Jake Tanti, Jeremy Abela, Miguel Zammit, Mathias Azzopardi (Neptunes), Ben Plumpton, Joseph Galea, Darren Zammit, Frederick Buhagiar (San Ġiljan), Jacob Sciberras, Isaiah Riolo (Sirens) Nicholas Bugelli, David Fenech, Michele Mifsud (Sliema). They are accompanied by coach Anthony Farrugia, his assistant Karl Izzo, physiotherapist Marco Vella and referee Peter Balzan. The group was due to leave early this morning.